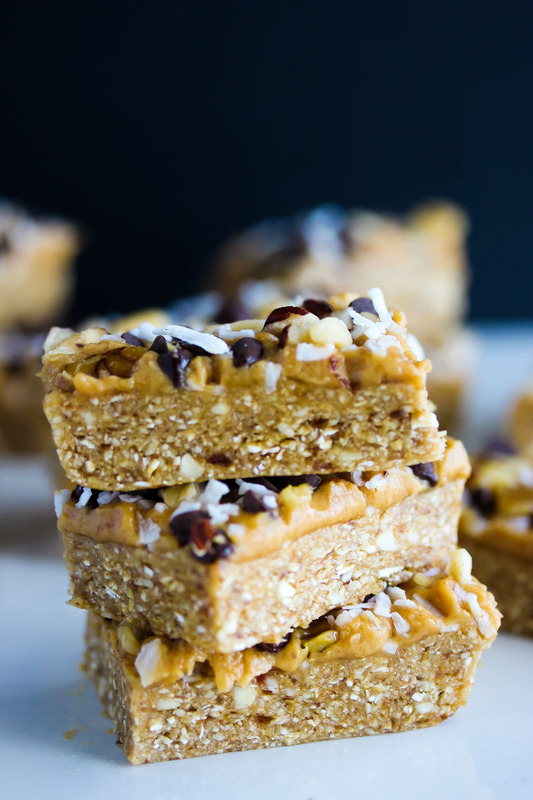 Vegan No-Bake Peanut Butter Magic Bars are the ultimate guilt-free treat. Naturally vegan, gluten free and with no refined sugar or flour, they are easy to make and even easier to fall in love with! These are legitimately the best things I’ve sunk my teeth into all weekend. Which says A LOT because it’s been a pretty indulgent weekend, to say the least. Brief recap of Saturday alone — S’mores donut for breakfast, toffee chip scones during afternoon tea and pork carnita TOAST with mashed avocado for dinner. Oooomph. ALTHOUGH, there has been means for celebration around here lately. If you didn’t catch the news on my Instagram or Facebook, I have accepted an exciting new job offer as an Assistant Nutrition Editor at Cooking Light magazine! Eeeppp!! I’m so excited and humbled by the opportunity to turn my two passions of cooking and nutrition into my CAREER. I’ve been pouring my heart into my blog for the past two years because creating recipes and writing nutrition-focused content is my passion. It’s a passion so deeply rooted that I could no longer ignore it. It fulfills me in a way that my clinical job hasn’t been able to for quite some time. I knew I was ready for a change and I couldn’t imagine this path being better suited for my goals and aspirations. But don’t worry, I will stay loyal to my blog and to YOU guys by continuing to post nutritious recipes. If anything, my content will only get stronger the more I learn and the more I grow as a writer. This is just the beginning, friends! Ok, back to the topic at hand — these BARS! The are the perfect amount of crunchy and chewy and salty-sweet. Think Larabar soft texture meets RXBAR simplicity meets KIND bar crunchiness. Yes? YES. 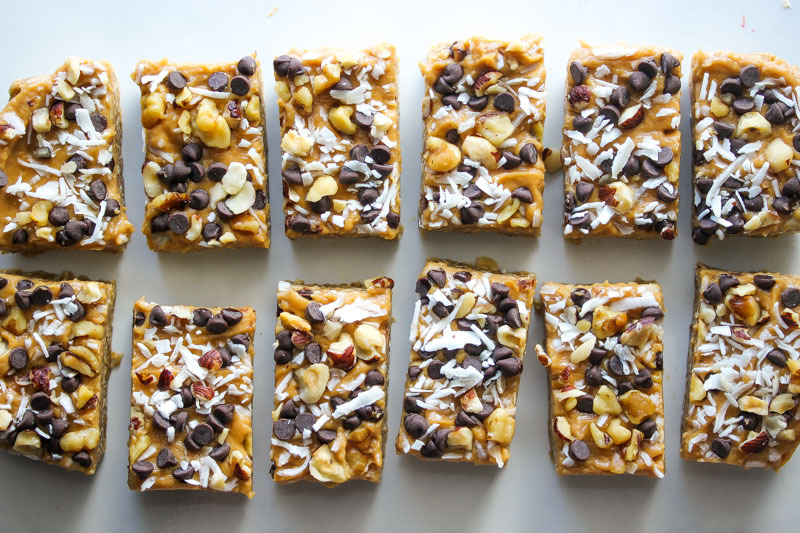 They are RAW(mazing) and no-bake and naturally sweet and extremely simple and just everything wonderful, stashed away in your fridge waiting for you at a moment’s hungry notice. BASE: dates for natural sweetness, creamy cashews, and old fashioned oats for texture. This glow-worthy trio is killer. PEANUT BUTTER FROSTING: Natural creamy peanut butter mixed with a touch of pure maple syrup and enough water to turn it into a dreamy glaze-like frosting (trust me on this one..). TOPPINGS: Anything you like!! <– best part. Shredded coconut, chocolate chips, nuts, seeds, etc. This is your time to get wild. 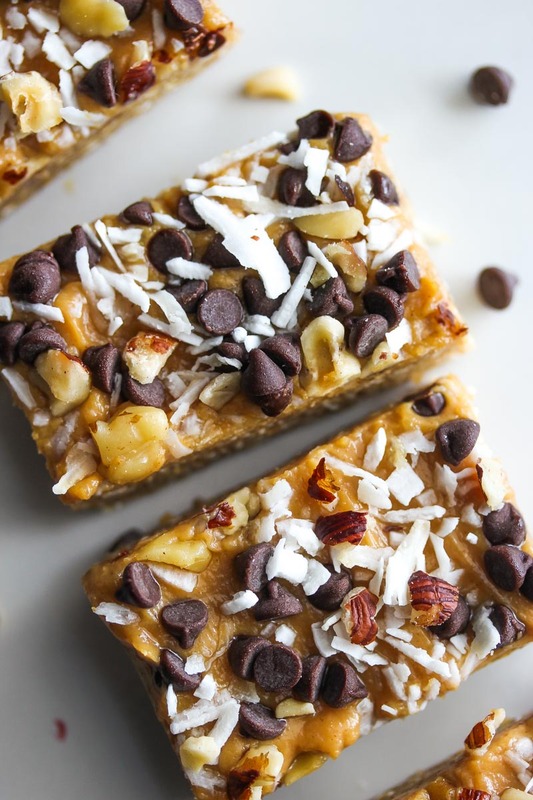 You may already have 90% of the ingredients on hand which makes these bars even more necessary to make. We’ve been snacking on them for pre and post-workout snacks, breakfast, dessert and everything in between. I actually plan on making at least 2 more batches to help us power through packing the next two weeks. Hopefully the “magic” in them can help us keep our sanity. 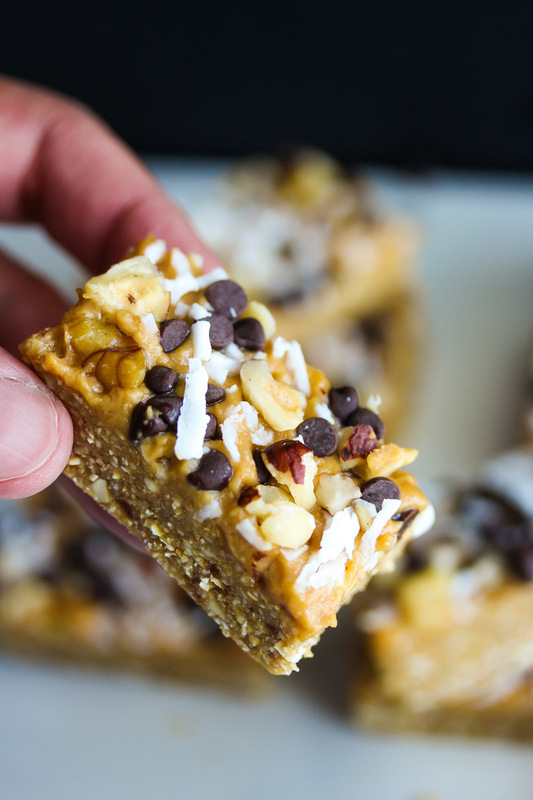 These magic bars are vegan, gluten free and the ultimate guilt-free treat! 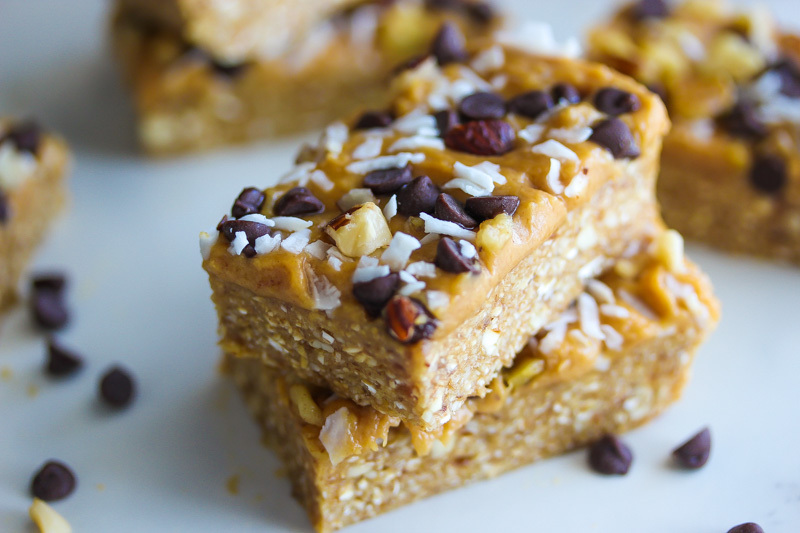 Enjoy them for breakfast, dessert or an energy-packed snack! Line a loaf pan with parchment paper and grease with non-stick cooking spray. Base: To a food processor, combine dates, oats, cashews and maple syrup. Process on high for 1-2 minutes, until ingredients form a block of dough. Remove from food processor and place in loaf pan. Press down to evenly distribute. It's helpful to grease the bottom of a glass measuring cup and use that to compress the dough evenly in the pan. PB frosting: To a medium-sized bowl, add peanut butter, maple syrup and 1 tbsp water. Use a wire whisk to combine, gradually adding in the additional water until the peanut butter starts to resemble a frosting. Pour over dough in loaf pan and use the back of a spoon to evenly spread out. 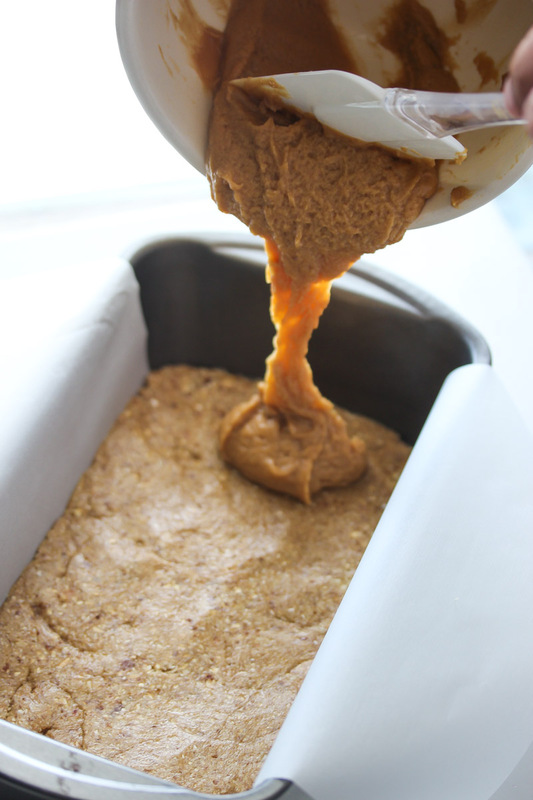 Sprinkle toppings evenly over top, pressing gently into the peanut butter frosting. Add a sprinkle of sea salt (optional). Place in the freezer for 1-2 hours or refrigerate for 5-6 hours. Slice into 12 bars and serve! Store covered in the fridge for up to 1 week. Oh wow. I think you are correct in doing this now, but wow. I wish I had constructive advice but I don’t just wish of good luck headed your way!And even more wow — Monet walls, can’t say I have ever seen that before! So happy about your new job! We subscribe to Cooking Light! What an amazing job opportunity! Hopefully we will get to meet face to face some day! Glad you will still be blogging! Would miss your recipes.